The Champagnois were off the hook and in future editions of this supplement we will report on how that particular ‘problem child’ vintage is progressing. But right now we have the latest edition of Drinks International’s The World’s Most Admired Champagne Brands. The ranking that follows is not necessarily about being the best of anything (see link for full methodology). The survey results are purely about opinions and perceptions – but from people who are in the trade and know about Champagne. So while we make no claims to be definitive in terms of quality, we are delivering a listing based on worthwhile opinions from people who know what they are talking about. Hopefully our survey will affirm your knowledge of the sector and possibly challenge some of your perceptions. Time moves on and sometimes one’s ideas become out of date and need to be checked and balanced. The one brand that exemplifies this, arguably more than any other, is Bollinger which, after a special year in 2016, returns to the number one slot it has already occupied twice before. In June 2016 Bollinger passed another milestone in the quiet revolution chief executive Jérôme Philipon has instigated since he took over the house in 2008 with the opening of two historically important new cellars at its home in the Grand Cru village of Aÿ. This was the culmination of a project that dates back to 2010 when, during the inventory of ancient stocks stored in the tunnels, caves and galleries beneath the house, an abandoned cellar containing old bottles and magnums of reserve wines was discovered. The forgotten cellar was divided up by amazingly preserved wooden panels used to identify the unlabelled bottles. Research revealed the origin and vintage of batches including the likes of 1886 Le Mesnil-sur-Oger, an 1893 Verzenay and even a 1914 Aÿ. The reserve wines found here show that even 130 years ago Bollinger kept such wines separately according to cru and vintage, as it does today. After archive research the meaning of an inscription CB14 was found to indicate the vintage 1830, the year after the house was founded, and the idea of showcasing this extraordinary legacy was born. These discoveries and this idea initiated a massive restoration project in 2012 under the guidance of cellar master Gilles Descôtes. Collecting bottles from different cellars and in varying states of preservation he and his team restored more than 4,000 successfully. To show these off to the best effect, Philipon decided to create two new cellars – one named La Réserve to house the single village reserve wines and the Galérie 1829 to show off the old vintages successfully restored in this three-year project. 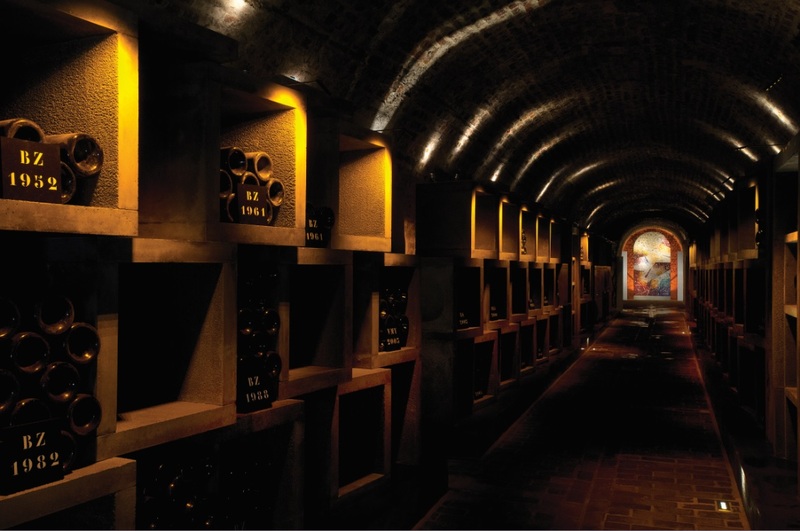 In all the two wine libraries contain champagnes from more than 65 vintages going back to 1830. While the Galérie 1829 holds 7,330 containers in a mixture of bottle, magnum and jeroboam format from 65 vintages, the La Réserve collection, with 3,125 containers from 45 vintages representing 16 crus is perhaps more significant for Bollinger, as it represents the blueprint for the house’s flagship Special Cuvée blend. Walking round this cellar last June it was interesting to note the significance of crus such as Cuis in the northern part of the Côte des Blancs, a village famous for its brisk, austere and long-lived Chardonnay. At the start of the tasting of old vintages last summer as part of the cellar opening celebrations, Bollinger chose to showcase another significant cru to the Bollinger style, namely Verzenay. The assembled international press corps had the chance to taste four reserve magnums of Verzenay from the 2002, 1999, 1992 and 1985 harvests. These building blocks for Special Cuvée were super-concentrated and aromatically complex, evolving from the orange citrus notes of the still remarkably fresh ’02. This introduction prepared the way for the central part of the tasting, where Philipon and Descôtes had selected what they considered to be a combination of the best and most significant vintages in the Bollinger canon from each decade. They kicked off with Vieilles Vignes Françaises 1969, then Bollinger RD 1952 – the original releases of these two cuveés – followed by the 1945, 1937, 1924 and 1914 vintages. The assembled international journalists were then treated to one of the only 13 remaining, successfully restored bottles of Bollinger 1830, 54 of which were unearthed during the project. For me the highlight was the multi-layered, intense, aromatically evolved ’69 Vieilles Vignes Françaises. But although the 1830 had lost its fizz, this complex, nutty, richly concentrated wine was by far the best 19th-century champagne I’ve tasted. As a demonstration of consistent excellence over nearly two centuries this was a feat that few, if any, other houses could match, underlying our voting Academy’s support for the Bollinger brand.